Spend a few luxuriously indulgent hours paddling with the currents as your highly trained, bilingual naturalist guides reveal the protected inland waterways of the Damas Estuary and mangrove habitat. Explore an unforgettable plethora of flora and fauna as you learn about, experience, and participate in the magical Costa Rican mangrove and tropical rain forest ecosystem. The pace of this adventure is determined by your abilities and interests, and the abundance of wildlife you want to stop and observe (or learn about) – all in its natural and breathtaking habitat. 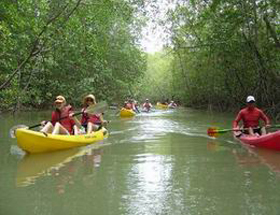 Watch sloths and numerous species of monkeys travel through the tree canopy, hunt for nocturnal silky anteaters and several types of non-poisonous snakes resting in the mangroves, and listen to the songs of the various marine birds as they glide over your kayak curiously looking for adventure. And whenever you want, stop and enjoy some local fresh fruits and refreshments as you pause to savor your adventures thus far. This kayak tour is an unforgettably memorable experience that will help you understand and explain the exotic secrets and treasures of our Costa Rican tropical rain forest. And after your adventure, yet depending upon the time your trip began, enjoy a delicious and well-deserved Tico style meal (a hot breakfast, lunch or dinner) at one of the local Manuel Antonio restaurants. includes round trip transportation, bilingual guides and naturalists, kayaks and all equipment needed, security, a great hot meal, snacks and drinks. Excellent for adventurous individuals, families or groups of any age who want to learn and experience nature first hand � but children under age 10 might have to paddle in a double kayak with an adult. We recommend that you are relatively physically fit for paddling in an open-seat kayak for a few hours, and please wear comfortable clothing and sturdy shoes that might get wet. Bring or wear a bathing suit, sunscreen, towel, camera, and a hat.